Part C, also known as Medicare Advantage Plans, includes all benefits and services covered under Part A and Part B. It is run by Medicare-approved private insurance companies, and is an alternative to original Medicare. 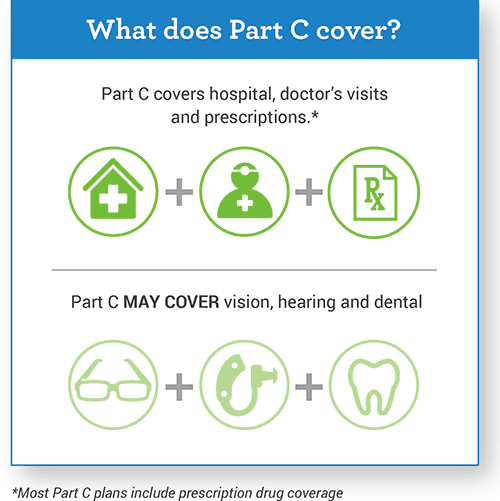 To receive Part C benefits, you must be enrolled in Part A and B. Medicare advantage plans usually include Medicare prescription drug coverage (Part D) as part of the plan. Why do some Medicare Advantage plans have a $0 premium? When you enroll in a Medicare Part C Advantage plan, Medicare pays a fixed monthly amount to the plan insurance carrier to provide your care. The insurance carriers will offer you a monthly premium as low as possible to attract you to their plan. Some carriers will even offer their plan at a $0 premium to you, but this can change from year to year as each carrier must renew its contract with Medicare annually. You will also still pay your monthly premium for Part B when you are enrolled in Medicare Advantage plans. You must be actively enrolled in both Part A and Part B to qualify for enrollment into a Advantage plan. What are the Medicare Part C enrollment periods? Medicare Part C annual election period begins on Oct 15th each year. Unlike Medigap policies, you can only enroll into or dis-enroll from your plan during certain periods. You can enroll in a plan during your initial enrollment period when you first get Part B. You can also change during the annual election period each fall, which runs from October 15 – December 7th, with your benefits beginning January 1st. The annual election period exists because if you are enrolled in Medicare Advantage or Part D, your plan’s benefits, formulary, pharmacy network, provider network, premium and/or co-payments and co-insurance may change on January 1 of each year. Medicare wants you to have an opportunity to change your plan if you don’t like the changes coming for next year.